In any sport, successful performance requires a planned approach to training and recovery. Whereas healthy adults are recommended 7-9 hours of sleep each night, some athletes, under circumstances of need, are taught to aim for 9-10 hours of sleep.1,2 Coaches and athletes rate sleep as critical to optimal performance,3,4 but the reality is that athletes are not getting it.5 Poor or inadequate sleep affects athletic performance, recovery, and may have systemic effects. 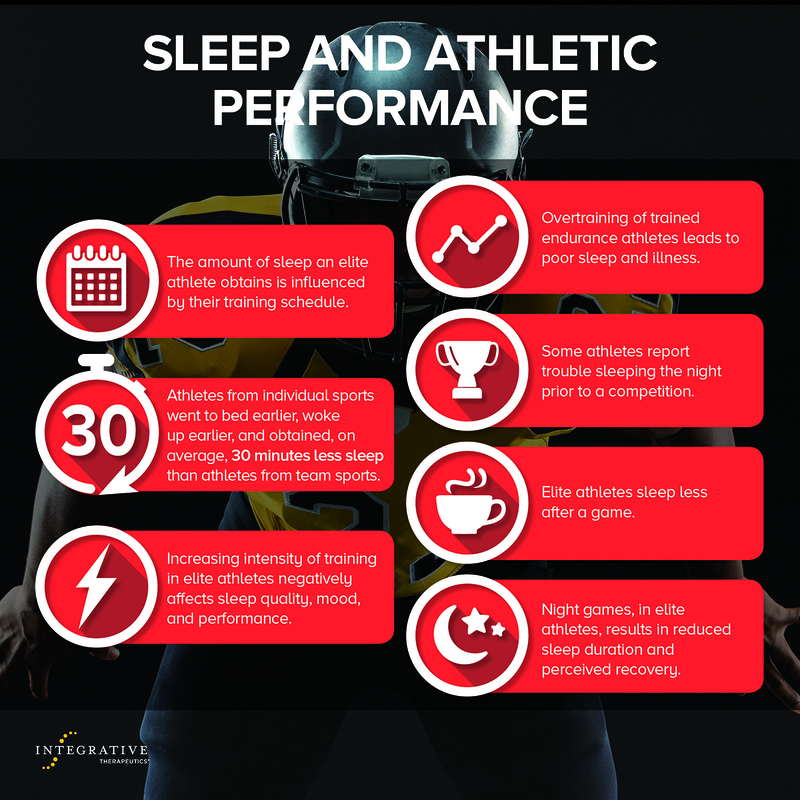 The effects of sleep on athletes are complex due to multiple mechanisms of action, as well as individual variations to required or perceived need of sleep and resilience to sleep restriction. Many studies have evaluated sleep deprivation, a prolonged period of sleep loss such as a whole night or longer; however, sleep restriction, the partial disturbance of the sleep-wake cycle, is more akin to real world experiences of athletes. The following is a sample of the evidence of sleep restriction in athletes that can help decision-making regarding the use of sleep support habits and/ or agents. The amount of sleep an elite athlete obtains is influenced by their training schedule. Athletes from individual sports went to bed earlier, woke up earlier, and obtained, on average, 30 minutes less sleep than athletes from team sports. Increasing intensity of training in elite athletes negatively affects sleep quality, mood, and performance. Overtraining of trained endurance athletes leads to poor sleep and illness. Some athletes report trouble sleeping the night prior to a competition. Elite athletes sleep less after a game. Night games, in elite athletes, results in reduced sleep duration and perceived recovery. Individual needs of athletes should be considered which makes guidelines and even team schedules difficult. While researchers seek to elucidate exact mechanisms of sleep and effects of sleep restriction in athletes, and are hesitant to provide practical recommendations, current athletes may benefit from the knowledge and web of evidence that has thus far been accumulated. Erin E. Ducat is a Board-Certified Chiropractic Sports Physician and Certified Strength and Conditioning Specialist who practices at Ducat Chiropractic & Sports Medicine in Bloomingdale, IL. She is the President of the Northern District of the Illinois Chiropractic Society and her practice focuses on the non-surgical management of sports-related injuries and athletic performance enhancement through functional rehabilitation strategies. Dr. Ducat graduated from National University of Health Sciences with her Doctorate in Chiropractic in 2006. She is currently seeking board-certification status with the Academy of Chiropractic Orthopedists and American Chiropractic Rehabilitation Board. 1. Ferrara M. How much sleep do we need? Sleep Med Rev. 2001;5(2):155–79. 3. Halson SL. Nutrition, sleep and recovery. Eur J Sport Sci. 2008;8(2):119–26. 4. Venter RE. Perceptions of team athletes on the importance of recovery modalities. Eur J Sport Sci. 2014;14:S69–76. 5. Venter RE. 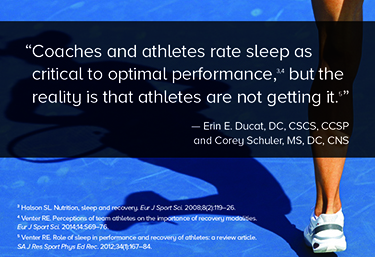 Role of sleep in performance and recovery of athletes: a review article. SA J Res Sport Phys Ed Rec. 2012;34(1):167–84. 6. Sargent C, Lastella M, Halson SL, Roach GD. The impact of training schedules on the sleep and fatigue of elite athletes. Chronobiol Int. 2014 Dec;31(10):1160-8. 7. Lastella M, Roach GD, Halson SL, Sargent C. Sleep/wake behaviours of elite athletes from individual and team sports. Eur J Sport Sci. 2015;15(2):94-100. 8. Killer SC, Svendsen IS, Jeukendrup AE, Gleeson M. Evidence of disturbed sleep and mood state in well-trained athletes during short-term intensified training with and without a high carbohydrate nutritional intervention. J Sports Sci. 2015 Sep 25:1-9. 9. Hausswirth C, Louis J, Aubry A, et al. Evidence of disturbed sleep and increased illness in overreached endurance athletes. Med Sci Sports Exerc. 2014;46(5):1036-45. 10. Juliff LE, Halson SL, Peiffer JJ. Understanding sleep disturbance in athletes prior to important competitions. J Sci Med Sport. 2015 Jan;18(1):13-8. 12. Fullagar HH, Skorski S, Duffield R, et al. Impaired sleep and recovery after night matches in elite football players. J Sports Sci. 2016 Jan 11:1-7.